What is Sunny Landing Pages? Sunny Landing Pages is a tool that allows just about anyone to build awesome and professional looking landing pages without any hiccups and IT expertise. 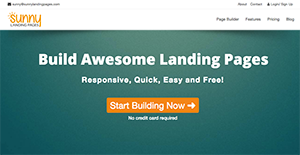 Whether you want to create a landing page from your own designs or pick from the hundreds of free templates available, Sunny Landing Page makes it all easy, fast, and affordable. Digital marketers will love the significant savings they’ll enjoy as the need to go and hire professional web designers is already addressed. All pages created using Sunny Landing Pages are optimized for mobile responsiveness. This means fater loading times on all platforms and significantly improved cost per Click and conversion ratios. Sunny Landing Pages is popular especially among marketers, thanks to its easy to use product and affordable rates. Even the free version is quite useful for small enterprises and freelancing professionals. Every page created with Sunny Landing Pages is built to be responsive in mobile devices. That means all pages are easy to design, resize, and rearrange without tweaking the layout details. The tool is made for users, specifically marketers, to come up with professional looking landing pages without the need to get expert help. Sunny Landing Pages is so easy to use that many marketers say they can create landing pages in 15 minutes without breaking a sweat. The free version is okay but to enjoy the full potential of Sunny Landing Pages, you need to shell out a few bucks. With paid subscription, users get unlimited landing pages and unlimited custom domains. It's essential to keep in mind that almost no service in the Content Marketing Software category is going to be a perfect solution that can fulfill all the goals of different company types, sizes and industries. It may be a good idea to read a few Sunny Landing Pages reviews first as certain solutions might dominate exclusively in a very narrow group of applications or be created with a very specific type of industry in mind. Others might function with a goal of being simple and intuitive and as a result lack complicated functions desired by more experienced users. You can also find services that support a wide group of customers and offer a rich feature toolbox, but that frequently comes at a more significant cost of such a software. Ensure you're aware of your requirements so that you pick a software that has exactly the features you look for. How Much Does Sunny Landing Pages Cost? Sunny Landing pages provides three pricing plans plus a free version for small businesses. We realize that when you make a decision to buy Marketing Software it’s important not only to see how experts evaluate it in their reviews, but also to find out if the real people and companies that buy it are actually satisfied with the product. That’s why we’ve created our behavior-based Customer Satisfaction Algorithm™ that gathers customer reviews, comments and Sunny Landing Pages reviews across a wide range of social media sites. The data is then presented in an easy to digest form showing how many people had positive and negative experience with Sunny Landing Pages. With that information at hand you should be equipped to make an informed buying decision that you won’t regret. What are Sunny Landing Pages pricing details? What integrations are available for Sunny Landing Pages? Sunny Landing Pages integrates with Google Analytics. If you need more information about Sunny Landing Pages or you simply have a question let us know what you need and we’ll forward your request directly to the vendor.